I’m sorry, he/she is not in at the moment. I’m sorry, he/she is not at his/her desk at the moment. I’m afraid he/she is on another line at the moment. I’m sorry. I’m afraid he/she is unavailable at the moment. He/She is out of town until Thursday. Sorry, he/she is out for lunch. Sorry, he/she just left the office. 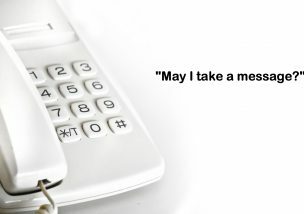 Would you like to leave any specific message or should he/she just call you back? Could you hold for a moment while I find piece of paper and a pen? When would you like him/her to call you back? Could I have him/her call you back? May I have your name and number please? Can I take your name and number? Do you want me to take a message? Hang on, let me grab a pen and paper. When do you want him/her to call you back? Can I have him/her call you back? Where can he reach you? I’ll let him/her know you called. I’ll give him/her the message when I see him/her. I’ll give him/her the message as soon as he/she comes back. I’ll have him/her call you back when he/she comes back. Would you take a message? Could you take a message? Would you mind taking a message? I’d like to leave a message please. Can you take a message? Do you mind taking a message? Can you tell him/her that (Jim) called, please? Please tell him/her that (Jim) called. Thanks! Could you tell him (Jim Helps) called, please? Please tell him/her that tomorrow’s meeting is at 4pm. Thanks, could you ask him/her to call me when he/she gets in? Could he/she call me back when he/she gets in? Could you ask him/her to call me back at 090-1234-…? Thanks. That’s okay, I’ll call back later. Sorry, did you say (13 or 30)? Sorry, Did you say your last name was (Williams)? You said your last name was (Williams)? Can I just check that again, please? Sorry, could you spell that, please? Do you mind repeating that please? Let me repeat that just to make sure. Let me repeat that just in case. Allow me to repeat that just to make sure. Allow me to repeat that just to be sure. Let me to read that back to you. Okay, I’ve got it all down. My name is Stephen. That’s S, T, T as in “tomorrow”, E, P, P as in “pool”, H, E, N, N as in “November”. I’m sorry, I can’t hear you very well. Could you speak up a little please? Can you speak a little slower please? My English isn’t very good. I’m sorry I don’t understand. Could you repeat that more slowly please? I’m afraid the connection isn’t very good. Could you repeat that please? I’m afraid the line is quite bad. Do you mind repeating that please? I’m sorry. You must have dialled the wrong number. I’m afraid you have the wrong number. I’m sorry, you must have the wrong number. There’s no-one of that name here. Excuse me, what number is this? Excuse me, isn’t this 090-1234-…? I’m sorry. I must have dialled the wrong number. I’m sorry. I might have called the wrong number. I’m sorry. I might have accidentally dialled your number. I’m sorry. I might have dialled your number by accident. Thanks for reading until the end! And don’t forget to smile on the phone, people can hear it!